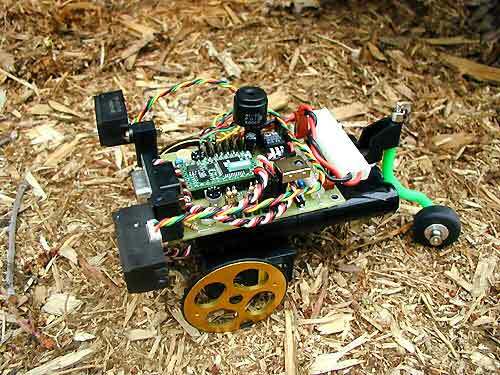 This is RIM (Robot In Motion) By Al. The Controller board (By ColorBots) sits on a 9.6 volt battery. His brain is a BX-24 (By NetMedia). His Eyes are SHARP GP2D05 for Obstacle avoidance. from (HANGAR 9) # HAN3515. Everything is double sided sticky taped together, including the servos !! he sings a little song to let you know !! !